Do you ever go on those *what if* journeys, where you start thinking about one thing, and that one thing leads to another and on and on and before you know it you have designed and made 5 different knitted creatures and you're not quite sure how you got there, especially since you didn't start out contemplating knitting or small creatures, but you just know the trip was fun? Nope? Just me then...ha! These sweet little owlets are a result of one of those trips (well, one of the results, I'll share the others too if you'd like!) 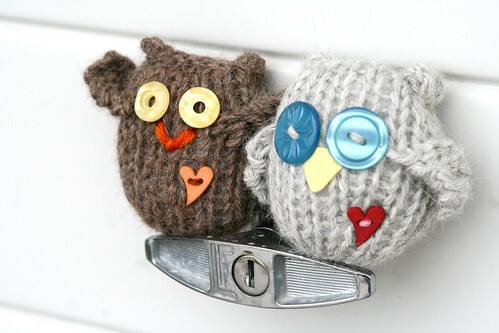 As I was knitting the first one (Brown Owl, I'm original like that!) I kept thinking of Hoot, the puppet owl presenter of a children's show here in Australia - he has a heart on his chest, and that inspired these hearts. It then occurred to me that some of you might like your own wee owlet, so I knit Blowfish (the silver dude) to double check what I had done, and so I could write down a pattern of sorts, and here it is - enjoy! A note about yarn, needle size and gauge: gauge doesn't matter. yay. Use any yarn along with a needle 3 sizes smaller than the yarn recommends (ie. if the yarn is sport weight and recommends using a 4mm/US6, then use 3mm/US3). 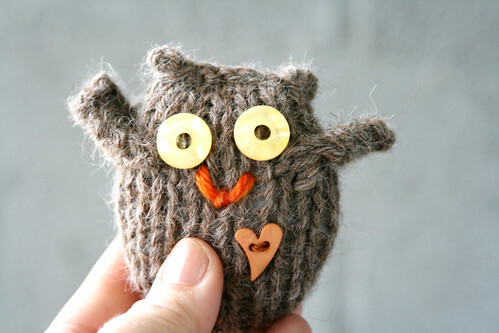 Alternately, you can also use your yarn doubled, and the recommended size needle.This means that the size of your owlet will vary, but for reference, Brown owl is knitted with doubled light sportweight yarn alpaca and size 4mm needles, whilst Blowfish is made with a single strand of chunky yarn (also alpaca) and size 4mm needles as well - Brown Owl is 2.75" tall and 2.5" wide, and Blowfish is just a smidge more. Cast on 12 stitches with dpns and join in the round. 19: bo/leave on needles to kitchener after stuffing. 1. Draw up the CO row of stitches and secure. 3. Close the top seam so that it is a long line (not a drawn up circle like the owlet's bottom) so that the edge starts and ends above the middle point of a wing (not fron to back as if there were a mohawk!) Now stitch that hole shut by you preferred method - either ladder stitch the BO edge, or kitchener it together. If you don't know what Kitchener stitch is, check it out here - it's a great trick! 5. Add eyes, a beak, and maybe a little heart so nobody confuses him for the Tinman. Et voila! If you make one (or a parliament! ), I'd love to see - you can add them to the Tropical Soup Flickr group (how terribly presumptuous of me!) Thanks, and enjoy! you can see more lovely creations over at Our Creative Space. A note about this pattern: it's my free gift to you. 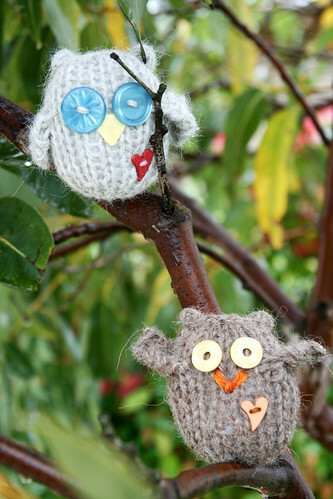 Free is free, the pattern belongs to me, but you're welcome to make owlets for yourself, for charity, to give away or sell. I only ask that you acknowledge the pattern is a Gawjus design by Tropical Soup. Thanks!